“You ain’t exactly sure if you’ve been away a while” – Noel Gallagher. 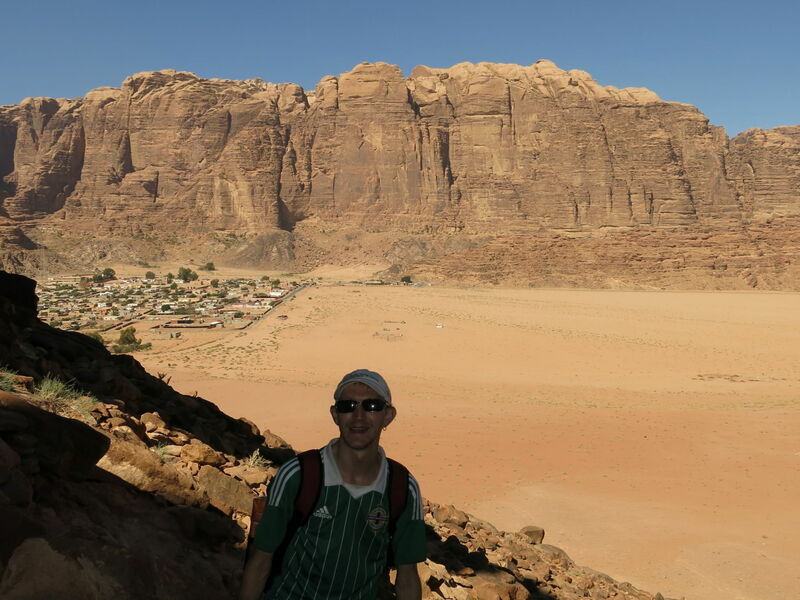 Backpacking through the Wadi Rum desert in Jordan – just amazing!! As the clock struck midnight on the 26th September 2013, I had hit that milestone I never thought possible. 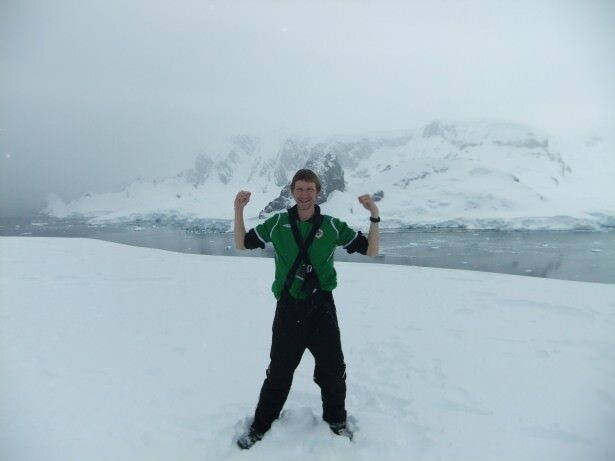 It was 10 years exactly from the day I left Northern Ireland behind. 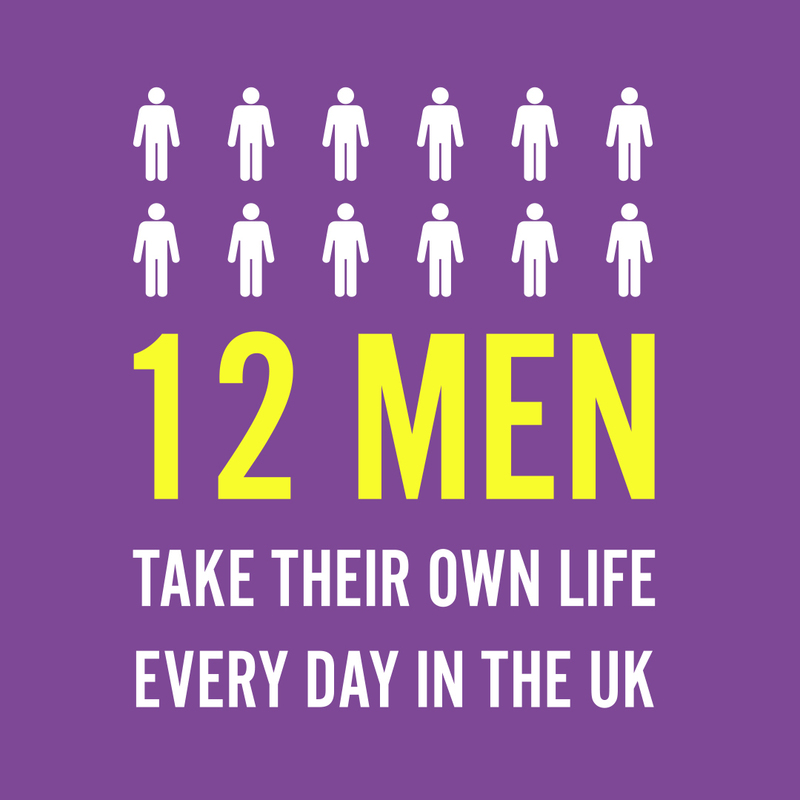 There was never a plan to leave Northern Ireland, life just happened like that for me. 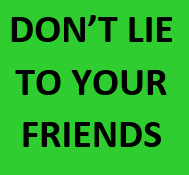 I only left to see how life was outside my beloved country, and that my friends is the gold nuggeted truth. I got out to see the world and never looked back. As the 10 year milestone hit, I found myself in Jordan in the Middle East. There was no conscious decision to be in Jordan for my 10 year anniversary. Indeed, the way it happened was even more remarkable than I could have imagined. 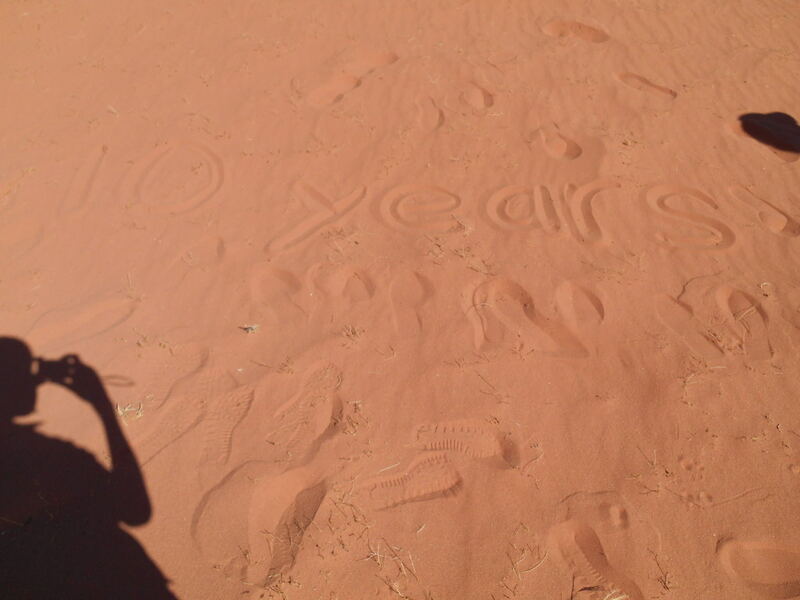 On my 10 year anniversary, I spent the day hiking in the Wadi Rum desert with Rumstars. – Hiked the Inca Trail in Peru, enjoying Christmas Day at Machu Picchu! – I backpacked in Iraq, becoming the first travel writer to cover Saddam Hussein’s House of Horrors on a non commercial blog. 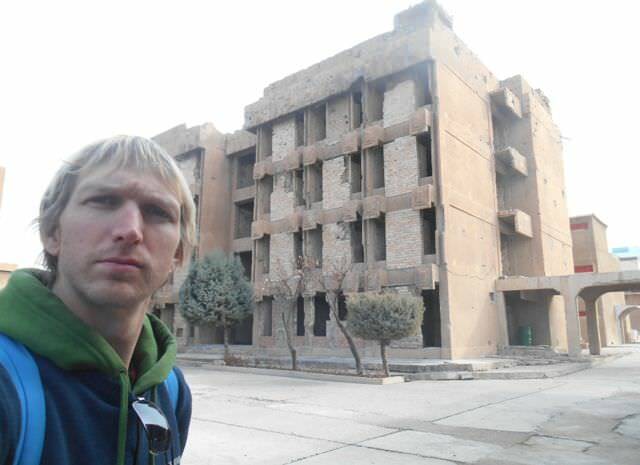 No smiles – The first professional travel blogger to uncommercially cover a trip to Saddam Hussein’s Amna Suraka in Iraq. – Crossed the South Korea to North Korea border near Kaesong, drinking Guinness at it, on tour with Gareth Johnson’s YPT! But I’d never hiked and walked through a desert in almost 40 degrees of heat. As the sun rose over southern Jordan, that was all about to change as Panny Yu and I embarked on an amazing desert hike through Wadi Rum with the excellent company Rumstars. Rumstars are based in Rum Village and can arrange hiking, camel riding and jeep tours all around the nearby deserts that eventually sand-connect to Saudi Arabia. 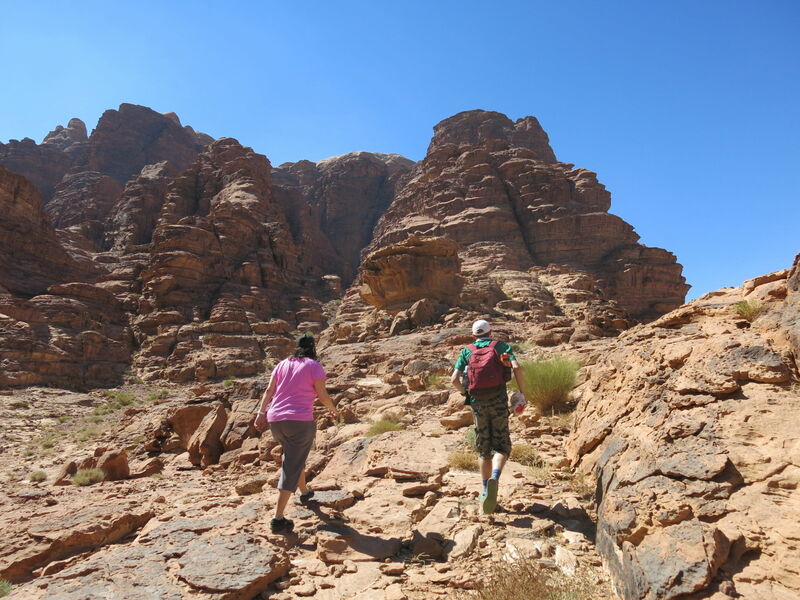 While that may be off limits, your experience at Wadi Rum will live forever…we did the one day one night canyon tour. 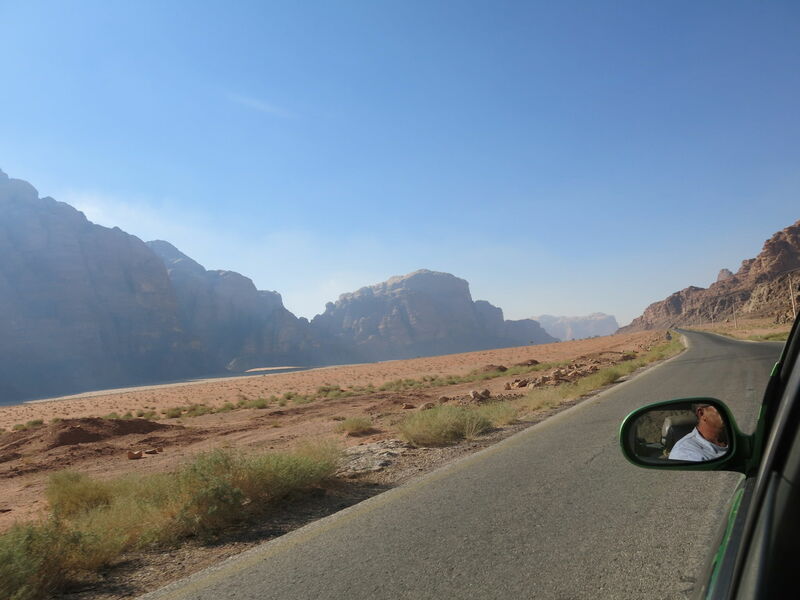 Morning shared taxi from Aqaba to Rum Village for Wadi Rum. At 7.58 am, a shared taxi took us from the town of Aqaba (you’ll hear more about it too, it sits almost on a quadruple border between Egypt, Israel & Palestine, Saudi Arabia and Jordan) to Rum Village. Expect to pay 20 – 25 Jordanian Dinars for such a taxi. Use your bargaining and enjoy the 50 minute ride. Before 9 am we had arrived at Rum Village. Greeted by Ahmed of Rumstars at Rum Village, Jordan. 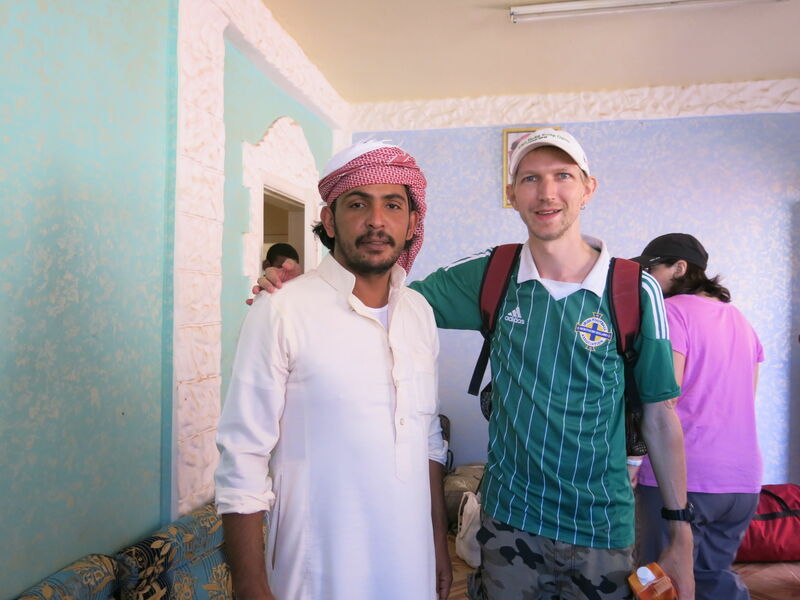 On arrival in Wadi Rum village, we are greeted by Salem, brother of Ahmed, the owner of Rumstars. After introductions and a visit to their house for tea, we are told about the tour route. I don’t do lazy and to celebrate 10 years we were going to be backpacking through a desert. I was just as buoyant as I had been as a shy and wondrous 23 year old 10 years prior. We met our fellow hikers Jonathan and Bailey (from Toronto, Canada) and set off on our way. We opted for 2 bottles of water and 2 cartons of juice. You also take your travel essentials in your backpack (i.e. sunglasses, sun cream, lip balm, snacks, hiking gloves, a cap, torch, jumper). Though the guys at Rumstars will drive your bigger backpacks to the camp for the night, so you won’t be carting 20 kg plus through this heat. A killer, believe me, I’ve been there and on a 10 year anniversary it was nice to have my lighter backpack for a change. 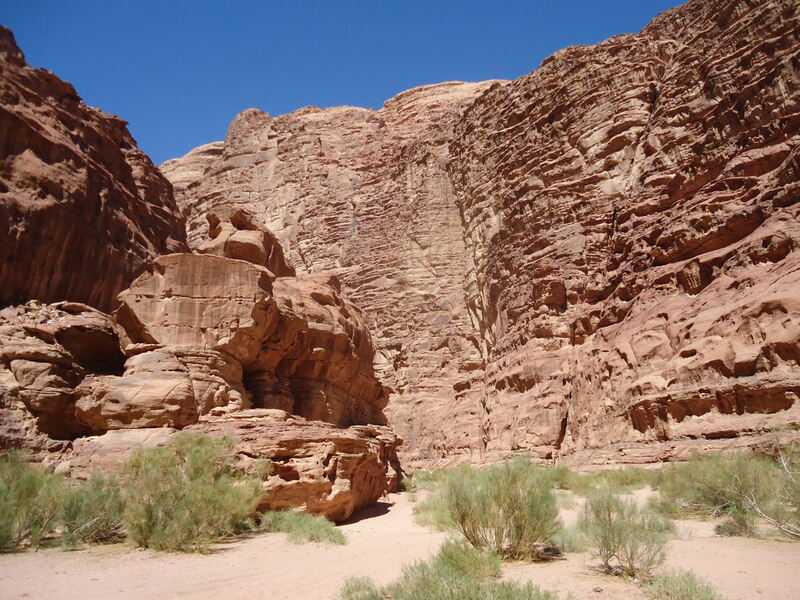 The start of the Rakhabat Canyon which we hiked through, Wadi Rum, Jordan. First part of the hike was walking up through the canyon and leaving Rum Village behind. The best thing for me, and perhaps the selfish aspect was that there were only five of us. Nobody else was doing the same hike which was amazing. This was untouristy. This was still as off the beaten track as my previous ventures to places like Suriname, Antarctica, Belarus and cities in China nobody has ever heard of. 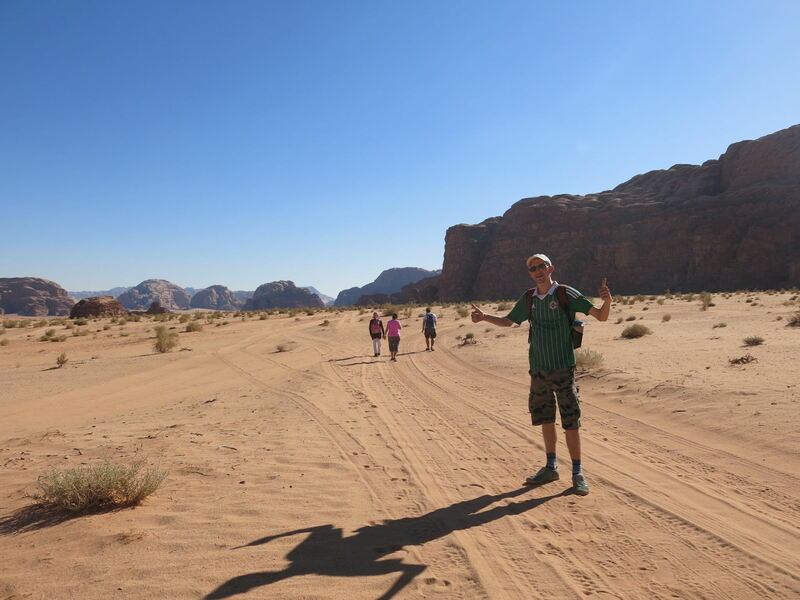 Wadi Rum is touristy, but we had the place to ourselves. That was pleasing. 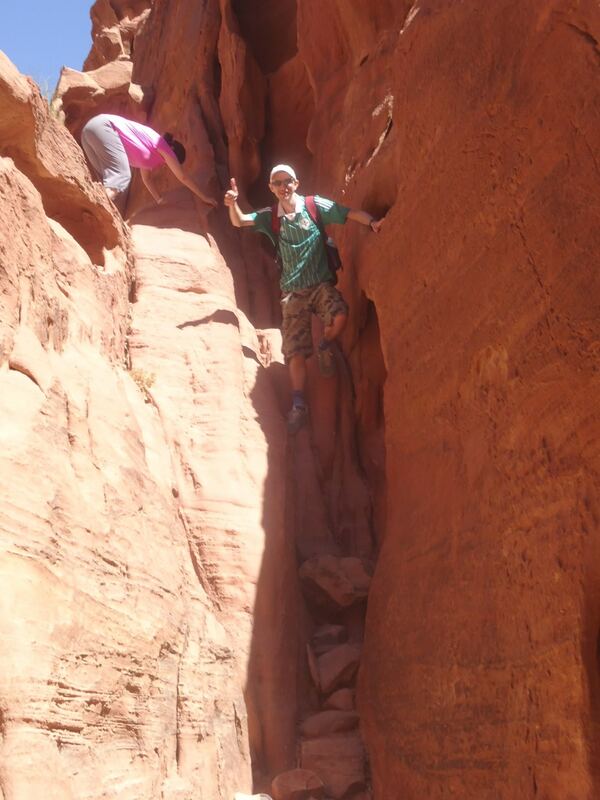 The rock scramble through the Rakhabat Canyon in Wadi Rum. There were a few tough parts to the climbing. My girlfriend wore gloves for grip. As usual I was in shorts and a football shirt with a pair of old trainers. But that was enough. Parts of the canyon are in the shade but sun cream is needed throughout the day. By 11.30 am we were at parts of the canyon where you could hear a pin drop. Rakhabat Canyon leads through Jebel Umm Al-Ishrin, which is the massive rocky area elevated above the sandy desert. 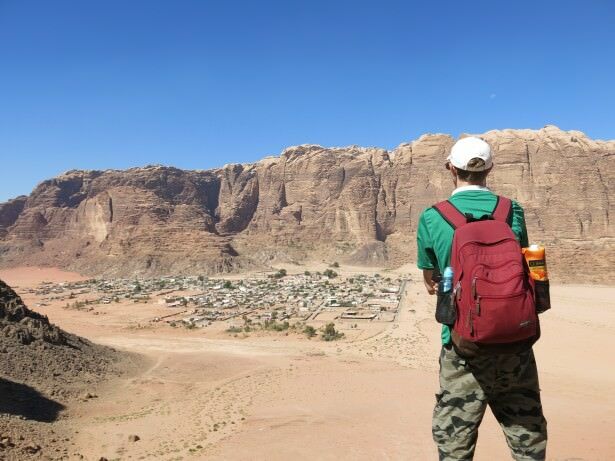 Backpacking through the Rakhabat Canyon, looking down on Rum Village in Jordan. Then came the echoes. It’s a great place to shout and yodel and hear the echoes all over the canyon. Our guide leads the singing at spells with Arabic songs, which we repeat. 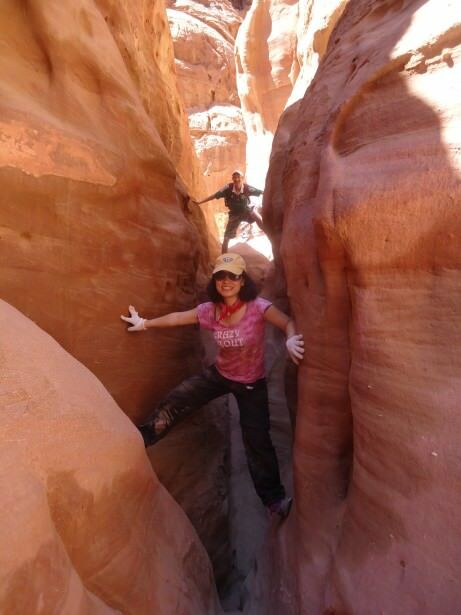 Scrambling through the rocks in the Rakhabat Canyon in Wadi Rum with Rumstars. By 1 pm we are in a lower part at the other side of Umm Al-Ishrin having successfully worked our way through Rakhabat Canyon. It’s lunchtime! My girlfriend Panny Yu and I scramble through the rocks at Wadi Rum, Jordan. 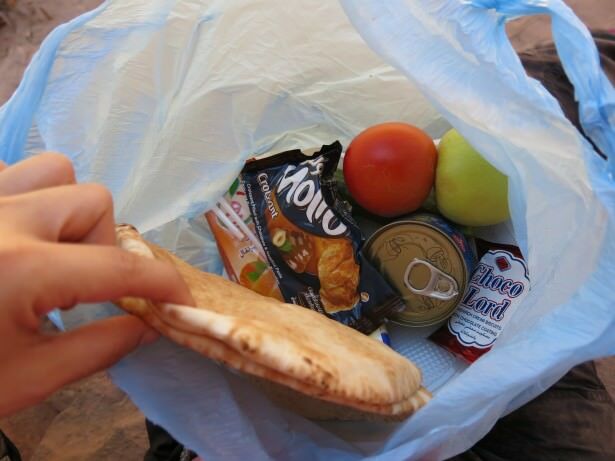 Our lunchbox, provided by Rumstars, includes an apple, a tomato, a cucumber, 2 bits of pitta bread, 2 triangles of cheese, a croissant, 2 fig rolls, a tin of tuna and an orange juice. Completely nutritious and ample. 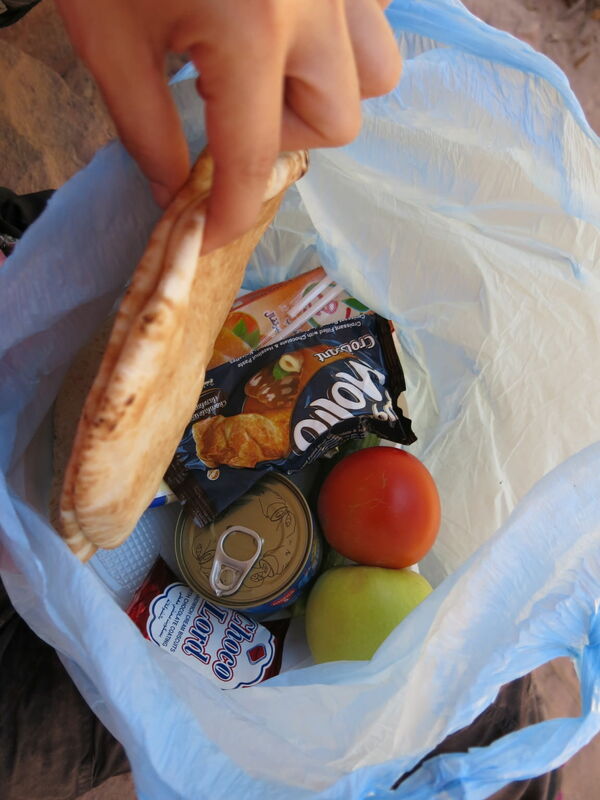 The excellent packed lunch from Rumstars – more than enough! Neither of us could finish it of course but we ate what we could to get energy for the rest of the day’s walk. We kept the rest of the food for the following day’s lunch. 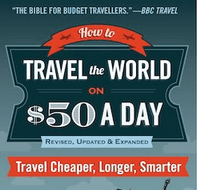 Budget backpacking is my forte…as you’ll have read from my Monday’s Money Saving Tips. The red sand dunes we passed after lunch – it was so hot at this point! After lunch we pass red sand dunes. You can notice the difference in the terrain and the colour of the sand. The sun beats down stronger too, just to remind us to drink more water and apply more sun cream. Our guide Eyat and the locals don’t drink water, nor do you ever see them applying suncream! They’re used to the climate of course, and they wear long sleeves, long trousers and cloths covering their head apart from their face. The Anfashieh Inscriptions on the rocks, featuring humans, caravans and camels. Next up we pass rocks with inscriptions on the side of them. Known as Anfashieh Inscriptions. 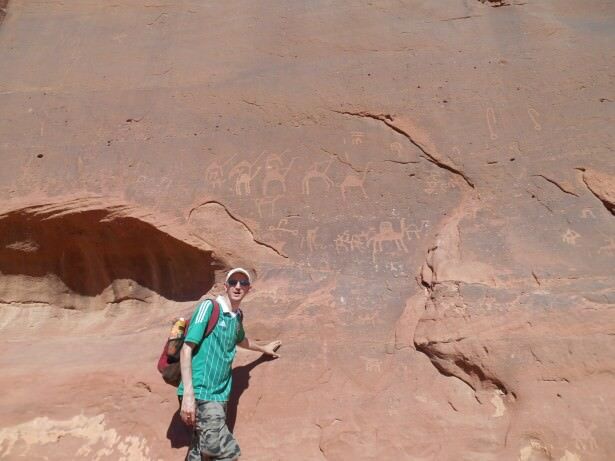 They are mostly of camels, and portray messages about where the water springs are and a warning that snakes and lizards roam the desert. Apparently they also have scorpions. We saw lizards but not the other two. The next part of the walk takes us to Lawrence’s House, also known as Al Qsair. 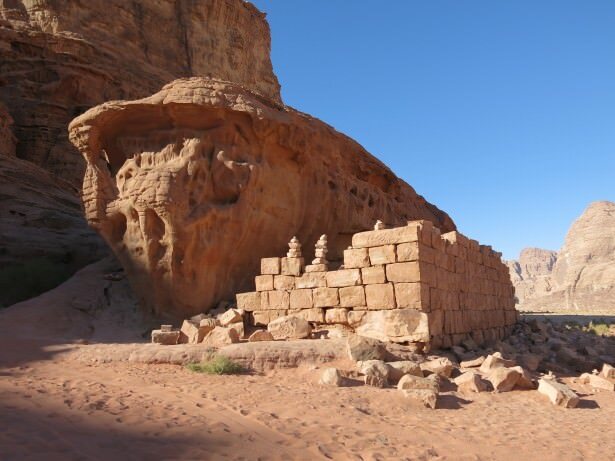 Rumour, legend and myth has it that Lawrence of Arabia sheltered here during the desert revolt. Even our guide is sceptical about the legitimacy of this claim. But take it with a pinch of sand, get your photos at “Lawrence’s House” and off you go and the last, easy walk to base. “I get so high, I just don’t feel it” – Noel Gallagher. 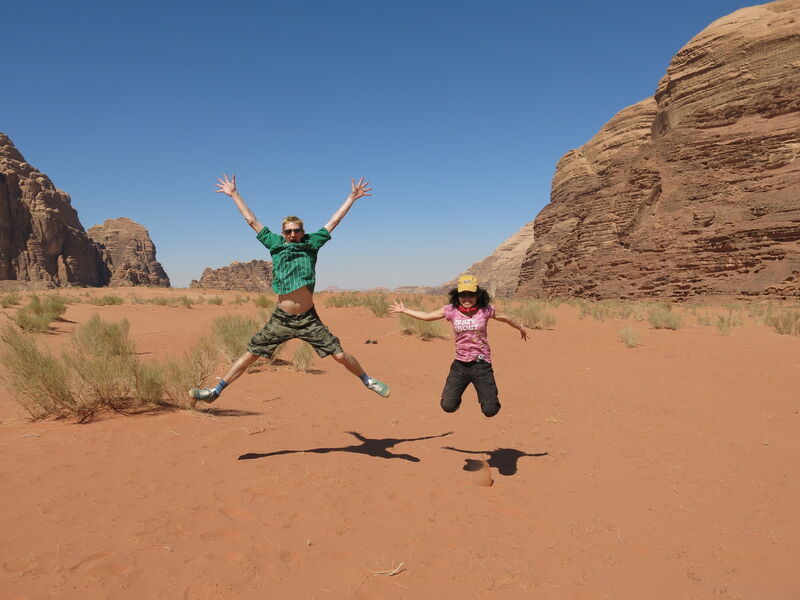 Synchronised jumping in the Wadi Rum desert in Jordan! It was around 5.10 pm, before sunset that we arrived at our camp for the night. Our camp is in the shadow of a rock mountain near Ar Raka rock. The camp consists of tents, a dining and lounge area and toilets. This is an exclusive camp for Rumstars. It is a Bedouin Camp,I’ll hopefully write more on that in times to come, some of it will appear in the book, Backpacking Centurion. For anyone that reads this, that is a preview of my book’s name incidentally. Relaxing at our awesome Rumstars Bedouin Camp after the day of hiking through the desert. A sweet moment to celebrate 10 years away from Northern Ireland. We got showered (don’t use too much water – it takes them a while to transport water over here) and settled ready for dinner and a night in the desert…more to follow! 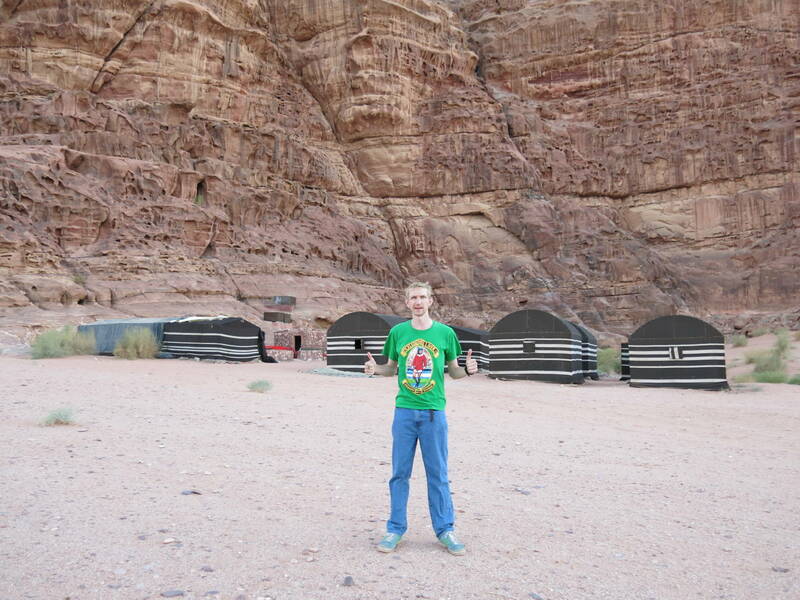 This entry was posted in Central Asia/Middle East, Jordan, Rumstars, Wadi Rum. Bookmark the permalink. Oh how lovely to see this, I really enjoyed meeting you in these deserts. Still such a coïncident. Like!!! Where is the pic of us? Like to have it 🙂 And I am still in for that interview we talked about. 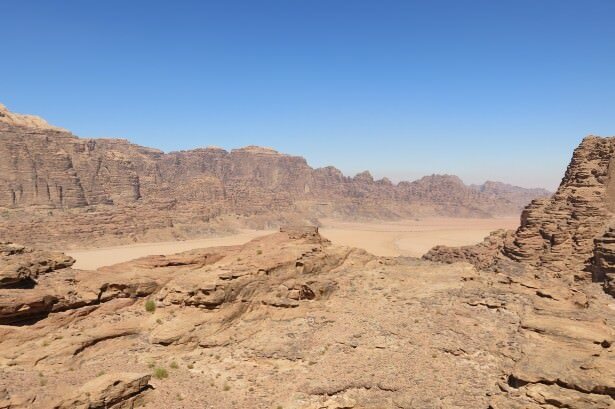 Great post Jonny, this looks like so much fun, I’m off to Jordan in March next year, can’t wait to go, I’m in the process of looking through your articles now for advice and to get an idea of what it will be like!